I’ve been sewing since I was 13 and am always amazed when I find a new tool and wonder how I ever got along without it. Here are some of my favorite finds from the last few years. 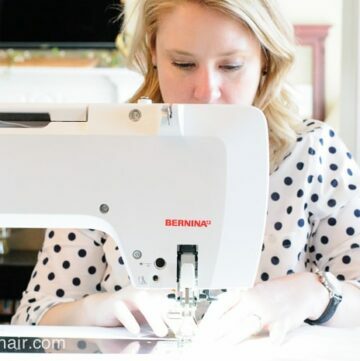 If you are just learning how to sew and consider yourself a beginner, I hope you find this list helpful. 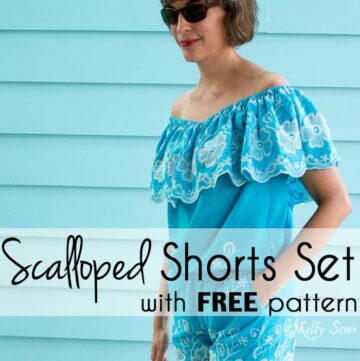 If you’ve been sewing for a long time then I hope you discover something new on this list to make your “sewing life” a little bit easier! This post contains affiliate links. Just before I jump into the list. 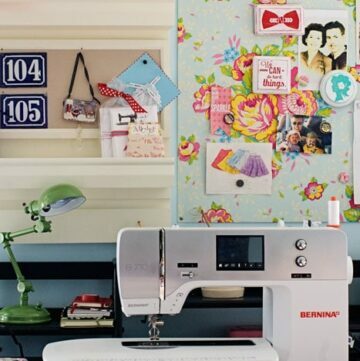 If you’re just learning how to sew, I’m going to assume you have the “basics”. A sewing machine, some sharp scissors, measuring tape and pins. That’s all you really need to get going. 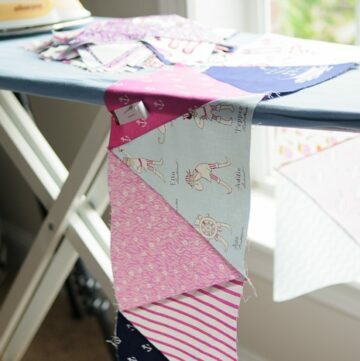 After you have those things and want to “expand” on your sewing tool stash, then you’ll want to start thinking about adding more fun notions. 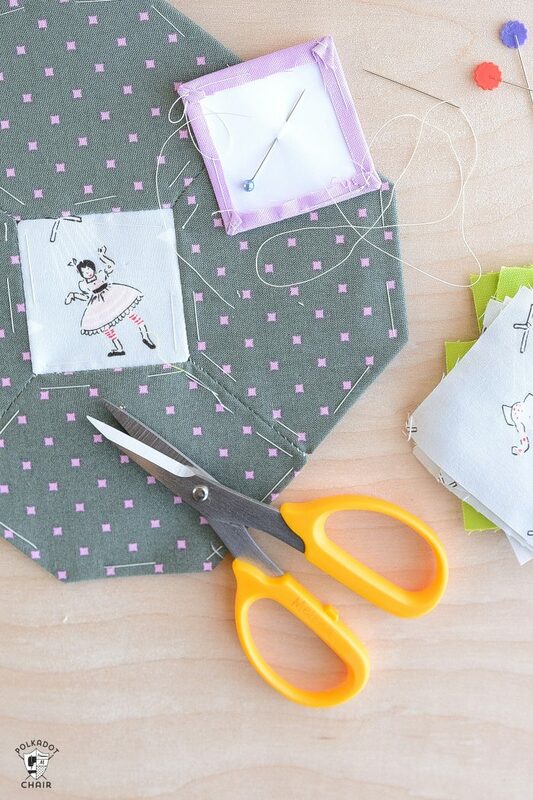 If you’re new to sewing make sure you check out these 50+ Fun Beginner Sewing Projects! 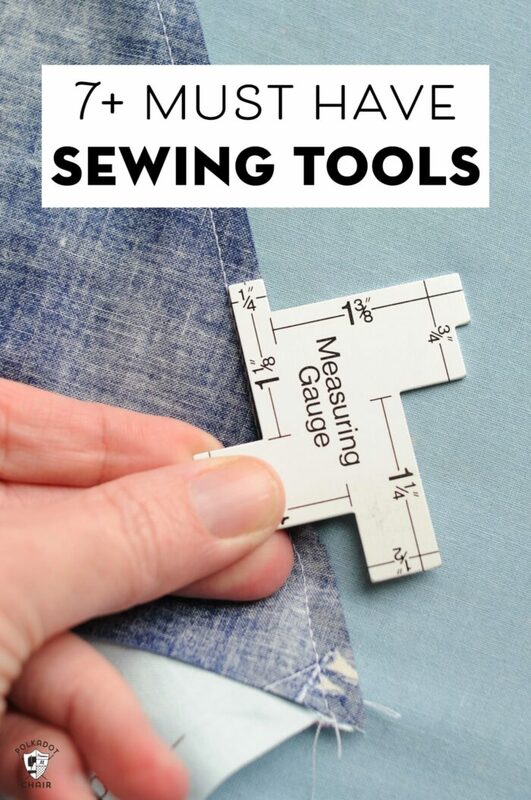 14 in One Seam Gauge: Any good seamstress knows that having precise seam allowances is vital to the quality of the finished project. Not sure where a 1/4″ or 5/8″ is on your machine? 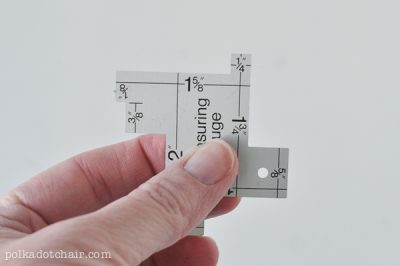 Double check it with this handy seam gauge. 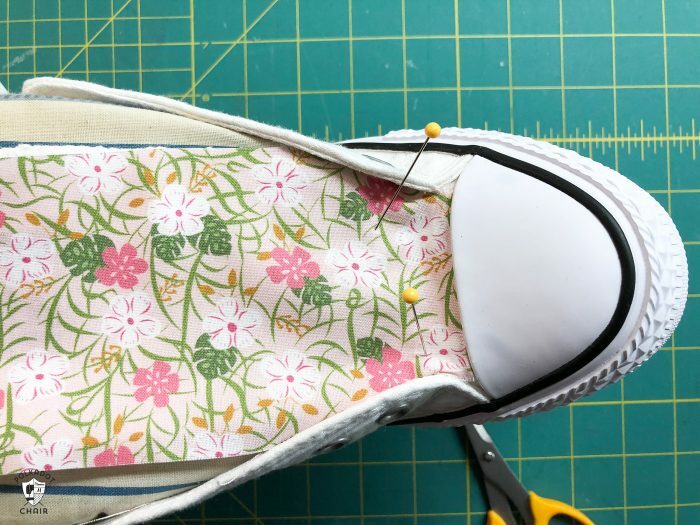 Sewers Aid: Sewing with Laminate fabrics or extra sticky interfacing? A drop or two of Sewer’s Aid on your machine needle will ensure smooth sailing. Hera Tool: It’s great to “push” corners out when you’re constructing bags, it’s also fantastic to use for marking on quilt blocks. Use the curved end with a bit of pressure to leave a “line” to guide your quilting. Olfa Scissors: These Olfa Scissors are always next to my machine. In fact, I bought a second pair so that I’d never lose them! They are super sharp and great for trimming threads, but also sharp enough to use to cut out small fabric shapes. Cut Glove: Take it from someone who has cut the end of their index finger off with a rotary cutter, you need to be careful! Sewing tools are sharp! I now use a cut glove on my left hand when I’m using my rotary cutter. 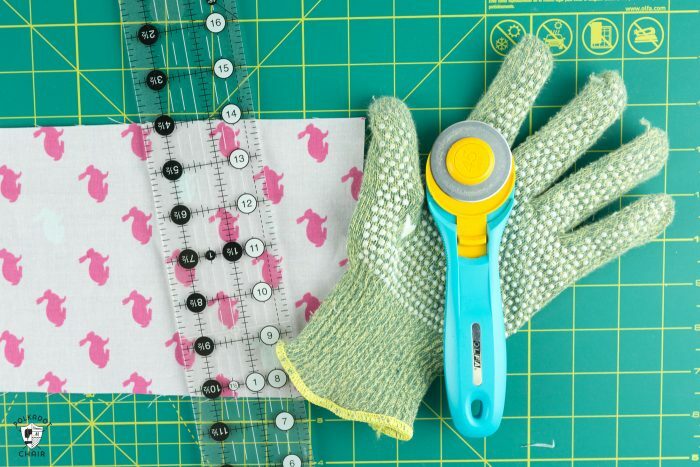 Sue Daley Rotary Mat: This round cutting mat comes in ever so handy when you’re trimming quilt blocks or squaring up fabrics. Don’t move your fabric, move your cutting mat. I use mine all the time. 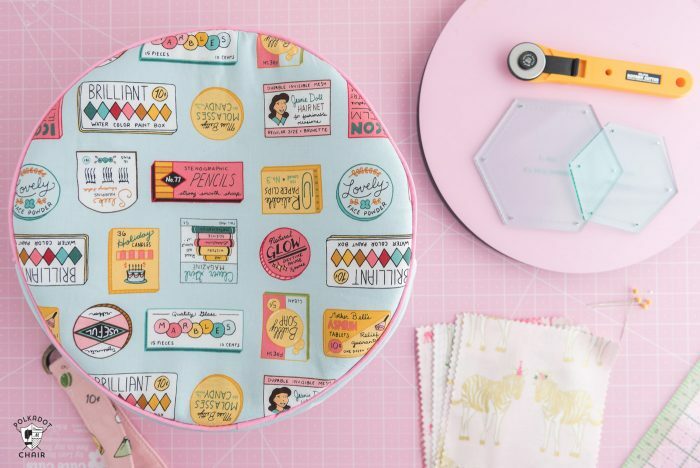 There are a few on the market, right now I love my Sue Daley pink mat (shown in the photo above with my Alice Bag – which is just the right size to hold the cutting mat- grab the sewing pattern for the Alice bag HERE). 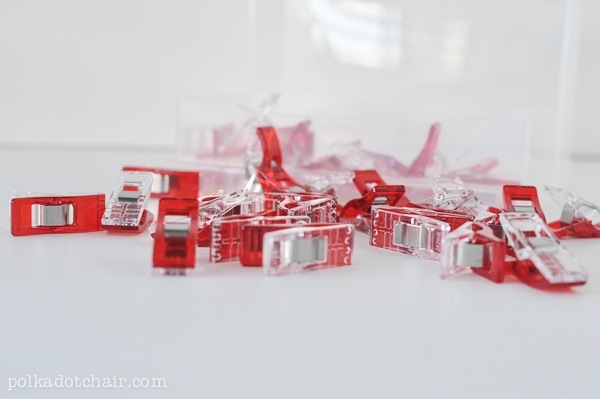 Quilt Binding Clips: You’ll use these for so much more than you think. They are great for holding heavy fabrics together, securing knits and yes of course, binding a quilt. No need to mark your hem and pin it before you press. Do all of the above in one simple step using this handy measuring tool. Simply fold your fabric over it at the desired hem measurement and press. Okay, so what did I forget? Let me know in the comments section! I’m sure you guys all have amazing favorite tools! I just bought a Hot Hemmer and now I can’t imagine how I’ve lived for almost 35 years of sewing without one:) And I think I’m gonna add a Cut Glove to my Christmas list.- I always end up cutting with a dullish blade cause I’m so scared I’ll cut myself. What a great list!!!!! I felt the same way when I got my hot hemmer! and let me tell you OUCH! Watch those fingers LOL! I love my little yellow rule tool for marking a scant quarter of an inch. I can’t remember where it came from originally and it has a 45 degree angle at one end (a bit irritating for marking) but it looks like the more up-to-date ones look more like rulers. I think I might update mine! 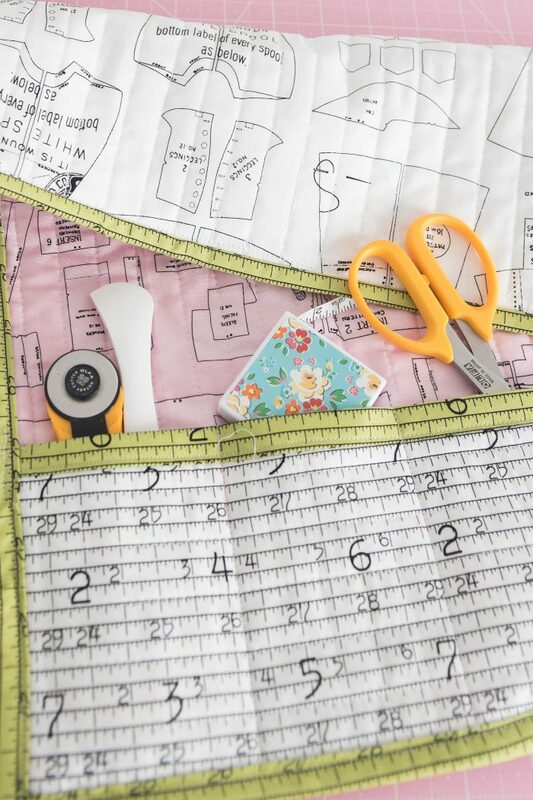 Called the Perfect Piecing Seam Guide (Creative Grids supply it among other places). And then we have the removable tape guides to mark along that line so it helps to line up the pieces before reaching the foot. I do have a quarter inch foot on my machine, but it’s next to useless as it doesn’t like anything bulkier than two flat pieces of fabric and quite inaccurate to boot! Oh I have that little yellow ruler too, I can’t remember the name either LOL! My go to tool is a pair of Ginghersnips I have on a ribbon I wear around my neck. I never loose them that way and ready to cut my threads! I like the Purple Thang tool from the Little Foot Shoppe.. Very handy for pushing out corners and the flat end is a 1/4″ which can be handy if you need to measure something while at your machine. I use the flat side to “finger press” too. When I am sewing with a really thick fabric such as denim, I love my Jean-a-ma-jig. I have a twelve inch piece of half-inch dowel that I sharpened to a dull point in the pencil sharpener. I rubbed it with some beeswax and use it to turn points, and tubes and also for rearranging stuffing in bears! Sometimes I even use it when ironing to hold down something that just wants to move!